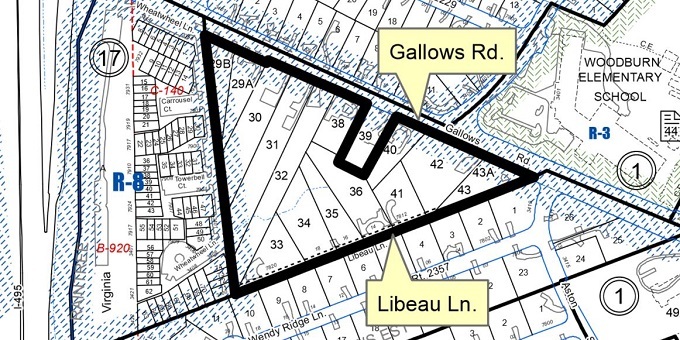 On February 13, 2019, the Planning Commission voted unanimously to indefinitely defer action on the proposed Gallows Road Development. This may or may not be the end. The current propoasl was a revamped version of a plan that had been rejected a year before. Another may yet rise to take its place. On November 27, 2018, the Mason District Land Use committee unanimously voted to not recommend approval of the proposal to the Planning Commission. The Planning Commission hearing originally scheduled for December 6th was postponed to January 9, 2019, and then again to January 30, 2019, supposedly for non-related reasons. Christopher Land is proposing to develop 72 independent senior living units on property located on the south side of Gallows Road, just east of I-495. Senior housing options will include single family, townhomes, and a condominium building. The application is a consolidation of 15 lots for a total acreage of 9.0299 acres, now occupied by single family dwellings, mostly constructed in the 1930's to 1950's. There is a prominent holdout property, forming a "piano key" sticking into the proposed development. Neighbors in opposition have been conducting a series of meetings with parties who might affect the outcome. The principle thrust is that this proposal is the same one that was rejected last year (on the same property, by the same developer), but now in the guise of a senior living community, which gives it some advantages and allowances. An unnamed tributary of Accotink Creek originates on the property, flowing under I-495 to join Accotink Creek north of Little River Turnpike. A narrow corridor of perhaps 10’ along this stream is protected by the Army Corps of Engineers as a palustrine wetland in the waters of the United States, even though there is no county Resource Protection Area defined here. Most of the stream is in the proposed "tree save" area, but the uppermost portion intrudes into the planned developed area and would likely be sacrificed. Planned stormwater controls include two or three raingardens, some Filterra inlets, and Jellyfish filters. There is no plan to use pervious paving, due to maintenance challenges. The main stormwater control is underground detention chambers of a capacity of 45,000 ft3 sized to control the 10-year rain event. 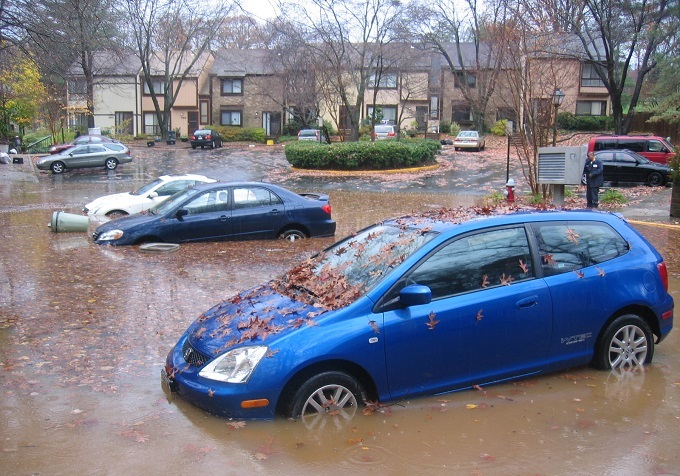 The Raintree townhouses downhill from the area are already experiencing regular parking lot flooding. Capacity will be increased to control the 100-year event if studies show the 100-year event reaches Raintree buildings (not parking). This increased storage would (of course) increase tree loss. All this requires a Special Exception to the county's Comprehensive Plan. The Mason District Land Use Committee rejected the proposal, but its actions are non-binding. The Planning commission considers the case January 9, 2019. Public comments may be addressed to plancom@fairfaxcounty.gov, referencing SE 2018-MA-005.